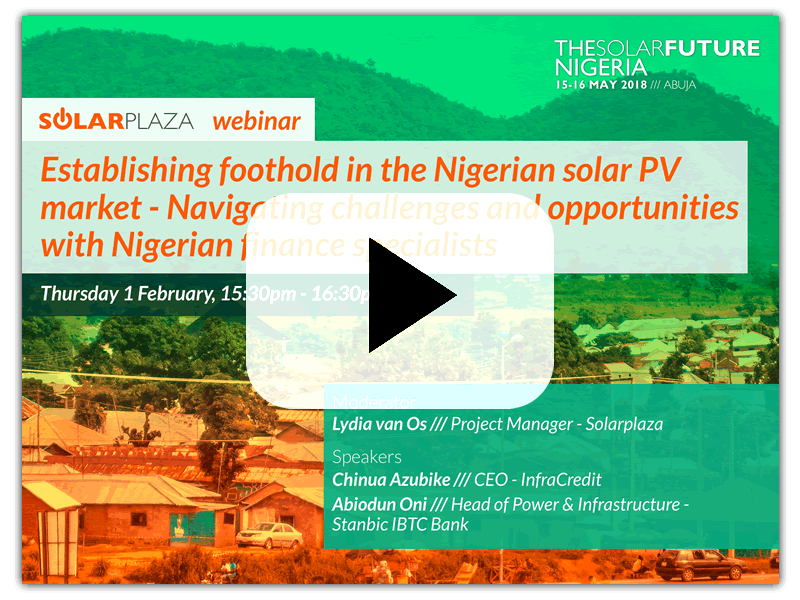 On the 1st of February, Solarplaza hosted a webinar on the different characteristics and latest data regarding the solar PV market in Nigeria, named ‘Establishing foothold in the Nigerian solar PV market - Navigating challenges and opportunities with Nigerian finance specialists.’ It was organized in the run-up to the 2-day ‘The Solar Future Nigeria’ conference in Abuja, that will take place on the 15th and 16th of May 2018. Lydia van Os, project manager at Solarplaza, was joined by Abiodun Oni of Stanbic IBTC Bank and Chinua Azubike of Infracredit to give an overview on how to attract investments, gain access to local currency and what the role can be of blended finance, innovative finance instruments and business models, as well as how to mitigate risks. The entire video recording of the webinar and the speakers’ slides can be freely accessed here. Abiodun Oni, Head of Power and Infrastructure at Stanbic IBTC Bank, started the webinar by giving some background information on the current energy situation in Nigeria. He began by discussing the details related to the history and privatization of the Nigerian power sector. For 50 years, there had existed a monopoly in the Nigerian power sector that was primarily controlled by the Power Holding Company of Nigeria (PHCN). However, in 2005, the Nigerian government enacted the Electric Power Sector Reform Act of 2005, aimed at unbundling the national power utility company into a series of successor companies. In August 2010, a ‘roadmap’ was launched, helping to set new standards for the Nigerian power sector, as well as giving official business guidelines to the investment world. In 2011, a number of key events took place, such as the establishment of a bulk trader to engage in the purchase and resale of electricity. After more or less a year, a new framework for a long term tariff model was established, namely, the Multi-Year Tariff Order (MYTO). This was supposed to capture cost based commercial tariff models planned for over a 15 year period. After 2013, the PHCN was successfully decoupled into multiple independent entities: 11 distribution companies, 7 generation companies and only one single transmission infrastructure company that was 100% state-owned. The generation assets were privatized 100%, except for the two hydro assets in the country that were concessionned for 30 years. In the case of the distribution assets, only 60% was privatized to the private sector, while 40% was retained by the government, which was essentially done in order to keep the possibility of being listed on the Nigerian capital market in the future. Fast forward to 2017: the market had gone through a number of challenges, mainly because tariffs were not completely established, as well as various political reasons. Illiquidity had also proven to be a big challenge, accumulating to almost 3 trillion naira since 2013, which translates to around 2.7 billion USD. However, in 2016, the federal government decided to let the World Bank step in to initiate the “Power Sector Recovery Plan” in order to help Nigeria’s privatised electricity market get out of its current difficulties. Nigeria currently faces a drastic difference between the installed capacity of the country’s grid and the actual electricity that is provided to the end-consumers. According to Oni, the inefficiencies in the power market in Nigeria are the main reason for the gap between electricity generated and electricity distributed. The current installed capacity of the grid is estimated at around 12GW, but the consumers are barely able to get 25% of that. The transmission system itself is significantly weak. However, in the last 12 months lots of investments have been made in the transmission grid and it has now actually surpassed the capacity of the generation and distribution system, exceeding expectations that were previously present in the industry. Overall, this does not change the fact that the end users are only able to get roughly 4000 MW of load, which translates to huge losses in the market that are not being recovered, especially since the tariff has technically not yet been approved. A way to combat these losses would be with the use of renewables. However, when the law of privatization was passed, almost no input for renewables was seriously factored into the plan. That only evolved as the challenges of the country’s dependence on gas as a primary source of energy became prevalent. Only then did the government feel the need to include regulation on renewables as a way to diversify its sources of energy. The eligibility of an asset depends significantly on the scalability of the product or project. Usually off-grid solar PV projects are developed on a small scale, but it’s important to know to which degree. Chinua Azubike, CEO of Infracredit, believes that when it comes to financing, size matters, in terms of liquidity and attractiveness to institutional investors. Besides the scale of a project, the next thing to focus on, when assessing the eligibility of an asset, would be the cash flow/product design and the type of payment structure. Azubike stated that, in order for an asset to grow, investors want to see a homogenous cash flow, where there is certainty of a long term, predictable cash flow in terms of payments. Some households/offtakers tend to have short-term offtake contracts, making it even more of a priority for investors to focus on the consistency and stability of those cash flows. Performance data was also found to be a key factor when assessing an asset, according to Azubike. Given how new this market is, investors want to see the history of how the households and offtakers have consistently been able to make the payments, to allow investors to gauge the level of affordability. There is still some uncertainty regarding the amount of historical data needed in the market to create a high enough comfort level, allowing long term financing to be provided for projects. Besides all of those challenges, the Nigerian market offers significant opportunities for off-grid and mini-grid power, as there is a relatively high level of economic activity, latent demand, and the ability to pay in both rural and urban areas. The Rocky Mountain Institute, in conjunction with the World Bank, released a report in December 2017 on the Nigerian energy sector, showing that the country consumes over 9 billion USD a year in inefficient fuel, used to power homes and businesses. The report also showed that, with the use of renewables, the country would be able to save around 4.4 billion USD per year, which makes it a huge opportunity for market investors. The biggest area of interest in the Nigerian solar energy sector so far has been the off-grid market. Considering the growth of the solar energy market, it will be interesting to see whether or not this will be mainly driven by corporate offtakers that provide counterparty risks acceptable to financiers, or from a big pool of individual homeowners that may not be able to enter into long term contracts. Oni points out that Commercial and Industrial (C&I) scale projects in Nigeria are the best choice for investors looking for a natural fit for projects that they would like to take to the bond market in the near future. Key considerations to have with regards to the opportunities in the Nigerian off-grid market involve different elements. One of them is the 15GW of sub generation energy capacity in Nigeria. The bulk of that energy is coming from C&I entities that use diesel generators as primary source of fuel, which is extremely expensive from the operational expenditure side and results in a very limited useful lifespan of the assets. This makes it a compelling opportunity for developers to work on creating structures for future offgrid solar solutions. When it comes to bankability, the growing pool of local & international developers has made the credibility of developers and the quality of off takers very crucial for establishing successful projects . For the first time in Nigeria, there is access to local currency for long-term funding. Before that, renewables were not competitive because of their high capital expenditure and because project owners could not spread the funding of the asset over the useful life of that asset. Now, it is possible to sign 10 to 25 year deals of long term local currency funding via Debt Capital Markets. Experts believe that, by doing so, it could result in a competitive tariff model for investors. One of the key questions right now is: Has any of the 14 PPAs (signed in 2016) reached financial close? The answer to that is unfortunately no, and there are a number of reasons for that. 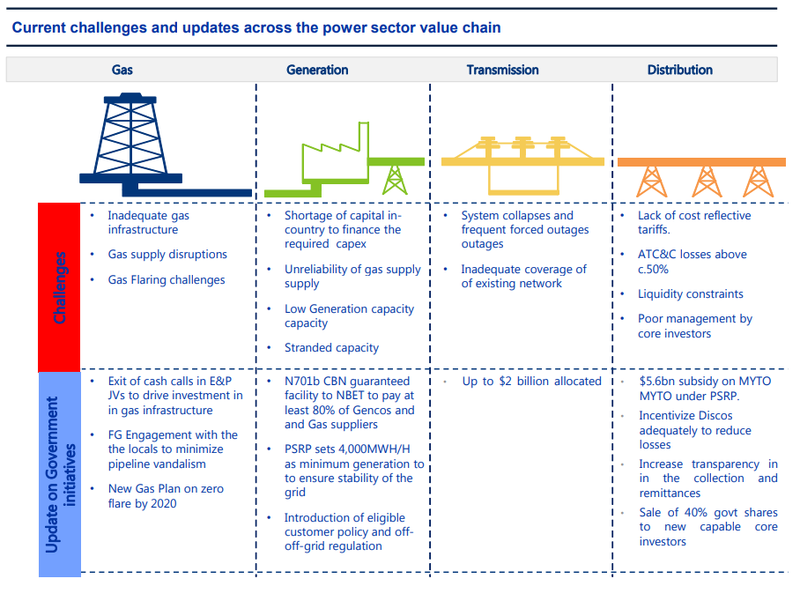 The most critical one is the fact that the market currently has excess energy capacity that is not getting to the end customers, resulting in the bulk trader not being incentivized to close these types of projects. There are also issues with the securitization of the PPAs, which has technically been resolved. However, because of the rise in costs, the regulators have tried to reprice the tariffs, going from 11.25 cents to 7.5 cents, which has been creating quite a challenge for developers. When it comes to on-grid PV projects, while the political rationale for it is quite compellent, there are many difficult challenges within the sector, especially with the fact that there is excess load on the market today that is going to waste. When it comes to C&I and off-grid projects, the situation is looking brighter. Rooftop and mini grid projects are being developed at a relatively higher pace, allowing for more stable and predictable costs in the future for end-consumers without having to be subject to market fluctuations. As more companies continue to deliver successful PV projects, solar energy is increasingly becoming more viable in Nigeria. Nonetheless, it still needs to be seen how the Nigerian solar PV market will react to future regulatory changes, and how the decreasing costs of solar and energy storage will affect the economic proposition for solar PV in Nigeria. Learn more about the challenges & realistic opportunities in the immediate future of solar PV for Nigeria at The Solar Future Nigeria (15-16 May 2018, Abuja). Join 250+ high level executives at the region’s leading solar event to discuss Nigeria’s On-grid & Distributed Solar Power developments.